In order to provide a long lasting and successful solution for education, an end-to-end software solution is needed. Such a solution should cover all aspects of learning, performance tracking, field management, data collection, data analysis and software/content updates. Good rendering software and great content are obvious requirements. However, content authoring being a time consuming and iterative process, great content can only be created if a good content authoring tool is available. To facilitate easy adoption of technology human intervention is needed. For such human intervention to be effective, a tool for managing the field operations is essential. Additionally, a software component is needed to analyse the field data, assess the impact of the program and provide feedback to the users in the field. 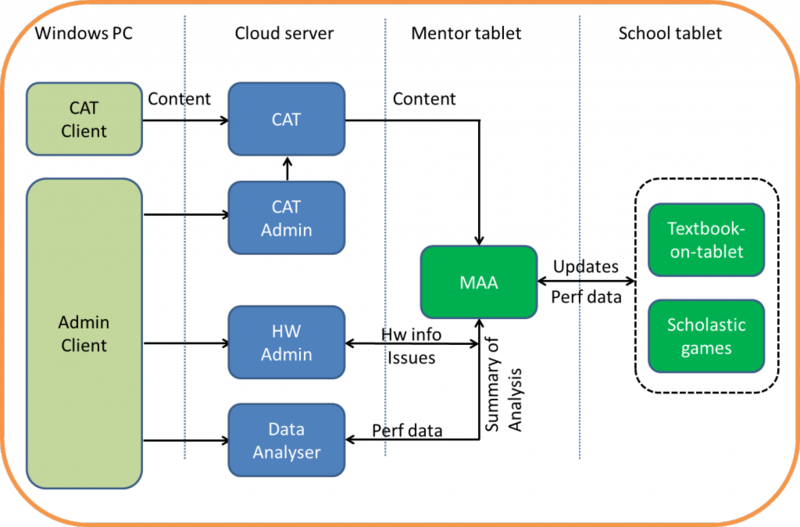 The software infrastructure that has been developed for the EducateZilla program to meet all these requirements is summarized in the picture below. 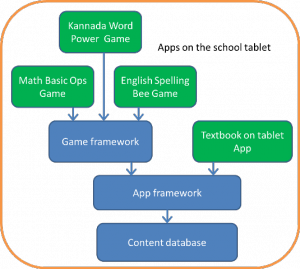 User apps: There are essentially four user apps that are part of this software infrastructure; Content Authoring Tool (CAT), content rendering app (Textbook-on-Tablet), scholastic games and Mentor Assistant App (MAA). Content Authoring Tool(CAT): The content authoring tool has been developed as an online tool so as to leverage the vast intellectual capital available in today’s world. The idea is to let content authors from anywhere in the world to create content at their leisure, using their own computers from the very comfort of their own homes. Since it is online, it is also easily available for partners from across the country to create and distribute content in the local medium. It is compact, easy to install and easy to upgrade as well. 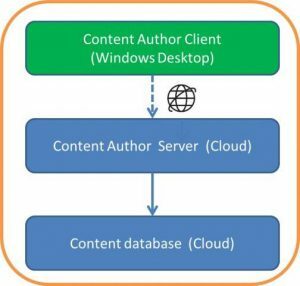 The content authoring tool runs on cloud server and employs the client / server model with the thin client being responsible only for the entry of the content by the content author. The server handles all the processing and content validation. The CAT is designed to allow the content to be easily organized as a hierarchy of subjects, chapters, topics and sub topics. It enables the categorization of content for different learning levels using which the content rendering app can adapt to the user’s pace of learning. The CAT facilitates addition of text, pictures and multimedia and verifies that the material added is of suitable length / duration / resolution for the target audience / device. More importantly, CAT makes it easy to add meanings, definitions, practice exercises and tests with questions/hints for different learning levels. It incorporates a content validation engine to catch unintended errors such as questions without the correct answer marked and deleted hints still being used and so on. It is generic enough to allow creation of different types of content; curricular or training or edutainment. Today the CAT is being actively used for creating curricular content, mentor training modules and teacher training modules. Content rendering app (Textbook-on-tablet): Considering that this component is intended for an audience whose brush with technology is most certainly limited to the use of a simple mobile phone, it is made into an app that is simple, robust and fun to use. It is interactive giving instant help / feedback to the user along with suitable rewards where needed. It appeals to children who learn technology quite eagerly as well as to teachers who are typically reluctant to adopt technology. It is self-contained with offline content. The software itself is language agnostic so as to enable the technology to be used pan India. If the NGO or the agency running the program at school wishes to keep the device within the school at all times, the app can be configured to track the device using GPS. Since a single tablet is likely to be shared by two or three children from a given grade and time-shared across grades, the app provides a multi-grade, multi-user environment. It tracks each user’s progress separately during the entire academic year. It measures each user’s progress not just in terms of marks obtained but as a weighted average of correct answers, time taken and help taken thus giving a more accurate picture of the user’s progress. As described in an earlier blog in this series, the Textbook-on-tablet in fact is a three-in-one solution acting as a self-learning tool, an assistant teacher and a continuous and comprehensive evaluation (CCE) tool. Scholastic games: A set of simple games have been devised for initial engagement of the children as well as to break the monotony of studying the same old curricular material. As part of the EducateZilla program, the following games have been deployed. A game for the four basic operations viz., Addition, Subtraction, Multiplication and Division. It has a self-learning mode where a child can input the operands and learn how to do the operation. This is extremely important for children from lower grades and slow learners who need help to understand each step of the basic operations. When the child makes a mistake the app corrects it by showing an animation of just that step and allows the child to attempt the next step. It also has a challenge mode where the child is given problems to solve. This mode awards score for correct answers while offering the child help when needed. It adapts itself to the child’s pace by increasing the complexity of the problems as the scores increase. A game for testing the child’s ability to spell English words is provided. This works along the lines of the popular Spelling Bee contest except that the word is uttered by the app on the tablet. The child can listen to the word any number of times before typing the spelling for the word. When the child makes a mistake, the app corrects it and allows the child to continue with the next letter. In addition, after some mistakes, the meaning of the word in the local language is displayed as a hint. Multiple variations of the same game have been provided. In one variation, the child is expected to input the English word by just viewing the meaning of the word in the local language, with no audio help. In another variation, multiple pronunciations are presented along with the meaning of the word in the local language and the child is expected to pick the correct pronunciation. In yet another variation, the child is expected to find the word which has the given meaning from within a longer word. . All these games use English words taken from their textbook so as to actively contribute to better academic performance. For various reasons which are beyond the scope of this blog, the rural children nowadays have little opportunity for general reading. In addition, there is an increased tendency to use English words in their daily communication without even knowing their proper application. As a result, their local language vocabulary is diminishing too! Hence, a game for testing the child’s local language vocabulary has been included in the program. This game challenges them to give the right word by looking at its meaning or a synonym or an antonym. Here again, the words are essentially taken from their own textbook. 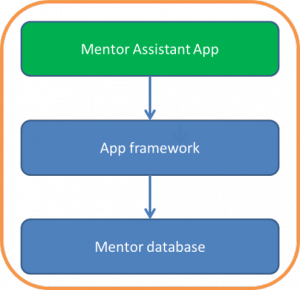 Mentor Assistant App (MAA): As mentioned in an earlier blog, as part of the EducateZilla program, Suvidya Foundation assigns a mentor for every 5-10 schools in the neighbourhood. These mentors perform all the day-to-day field operations like taking inventory of the hardware at school, training and motivating children to self-learn, training teachers, reporting and so on. Mentor Assistant App (MAA), a tablet based field management tool, has been devised to make the mentor’s school visits effective without using any paperwork. MAA allows easy logging of issues and reporting of progress seen in the school. This app uses GPS to automatically record the attendance of the mentor at the schools that are assigned to him/her. It allows assignment (or re-assignment) of children to different tablets at school. It obtains software/content updates from cloud server and distributes the same to the tablets at school. MAA collects the performance data from the tablets at school and delivers the same to the cloud server for analysis. Based on the data that it receives, it auto-generates various reports and charts to help the mentors focus on slow learners and schools that are underperforming. Backend tools: The next few sections discuss the backend tools that are needed for the administration and data analysis. All the backend tools run on a cloud server and are accessible over the Internet. Each of these tools also employs the appropriate security features required for the administration. Content Administration Tool: The content administration tool is needed to coordinate the efforts involved in building high quality content. The content administration tool makes it easy to assign (or re-assign) ownership of a module to a given author. The content administration tool runs on cloud server allowing different authors/reviewers to be registered, enabled, disabled and so on. The content administration tool allows the admin users to define the different modules and assign them to specific authors or reviewers. It also creates the standard framework for each such module and provides it to the content authoring tool which is used by the content authors to create the actual content for the module. The tool restricts the assignment of a given module to a single person at any time to avoid conflicting edits to the module. It enables reviewing of content by experts. It manages revisions of each module along with comments from the author or the reviewer. It enables feedback from experts to content authors along with appropriate context of the module under review. It can enable collating of selected modules into units to allow modular development of content. It also enables packaging and releasing of multiple units using encryption, if needed, to protect the content. It keeps track of the history of the packages for the purpose of distribution and administration. Content Distribution Tool: The content distribution tool is required to distribute the released content over the internet to the mentor tablets that request for it. In order to cope with the unreliable internet connectivity in the rural areas, a Wi-Fi based content transfer between two mentor tablets has also been implemented. This way, if one mentor tablet is updated using the internet (typically by taking it to a nearby town), it can in turn update the other mentor tablets in the vicinity. Hardware Management Tool: The hardware management tool is required to manage the assignment/reassignment of tablets to schools and tracking of hardware related issues. It records the issues collected from MAA and those entered directly along with timestamp. It tracks the issues and enables a time bound resolution. Data Analysis and Reporting Tool (DART): The data analysis and reporting tool is a critical tool needed to analyse the performance data collected by MAA from the school tablets. This enables periodic feedback to schools and identification of the top performing children and schools for recognition at the end of the year. Watch this space for our blog on how Suvidya Foundation mentors its field mentors.